Do you love to draw and color horses as much as Callan does? Well, if you do, this is the place for you! Pick from our gallery of drawings to print out pictures to color in. If you mail them to us or send us your own drawings, we'll post them in the kids gallery. 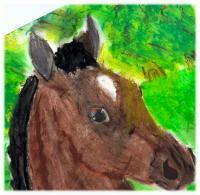 Visit our Kids Art Gallery - just click here. Click on the pictures below to view. Don't forget to get your parents' permission before you send us your pictures!